Downloaded. Or how the music industry changed forever. In past post we have been able to chat with emerging artists about where the industry is headed. One common topic when trying to decipher future paths has been piracy; what are it´s real effects on the industry? Can it be fought? Interestingly enough, earlier this week the trailer for VH1´s future documentary Downloaded: The Digital Revolution by Alex Winter was released. Under its subtitle “Napster: The Music. The Battle. The Revolution” it will take a look at Napster´s history and how Shawn Fanning and Shawn Parker revolutionized the music industry, instigating a file-sharing phenomenon that has grown to a point that it has become common nature. Interview: Music Industry today…and tomorrow. The view of a growing band: Malpaso. Continuing with our journey to discover what industry players think of where we stand today and where we are headed, we come to Barcelona to get the view of a growing band. In our previous interview, we to spent some time with the managers of The Dirt Tracks, if you didn´t have the chance to read it yet, take a look at what they had to say here. Today: The view of a growing band: Malpaso. Malpaso: Héctor, Javier, Alex & Adrián. Javier Albandoz, Héctor Hidalgo, Alex Pardo and Adrián Renna are Malpaso, a growing Rock n´ Roll band from Barcelona, Spain, that has just recently published it´s second album No importa lo que cueste. Malpaso is synonym of Rock n´ Roll…pure and classic R n´ R; reminiscent of older days, but with an up-to-date twist. Winners of the 2011 Wolfest competition held at one of the most prestigious clubs in Spain, Razzmataz, Malpaso excel on stage, where their setting and enthusiasm manage to transmit with the audience and make their shows a must see event; drawing attention even from established industry artists. A bright future lies ahead of these hard working guys. And hard work is always rewarded. Malpaso has received very positive reviews by specialized media and blogs and have an unconditional and supportive fan base. The band has been able to produce their second album thanks to the help from their fans, as their crowdfunding project was a total success! We speak with frontman Javier Albandoz, let´s see what he has to say! Q: The Music Industry is becoming a digital world, where the presence of physical elements is on a continuing downfall, and where music is now available to anyone, anytime, anywhere. How has this affected Malpaso? What are you doing to embrace this digital era? Javier: It has totally affected us. The majority of the audiovisual promotion of our first album was done over the Internet. And we will do the same for our second one. The main difference with our first album is that we plan on releasing it first on platforms such as Spotify and iTunes, and physically later on. This helps us immensely in our promotion efforts, and also keeps costs low. We coexist perfectly with this digital world…and we like it. Q: How has the decrease in physical record sales affected the revenue generating capacity of the industry? How is the industry making up for it? J: Indeed this is what is happening. You have to emphasize on live performances (where CD sales keep increasing). In order to make a profit, live performances have become the main weapon of any band. Before an artist could live exclusively on the sale of its records; that is not so anymore and it explains the abundance of tours and the high ticket prices. Live shows are the only thing that cannot be pirated, because it´s not only an audiovisual experience, it´s a vital experience, and that is unique and inimitable. On the other hand, like I said before, people are buying more CDs at live shows, especially if they can get it signed by the artist, which is proof that the fetishist nature of owning a physical album has not quite died. In some cases it has even increased. Q: And how has it affected you as an emerging band? J: Exactly in the same way. With our first album (Malpaso I) we played close to 70 gigs all over Spain, which for a band at our level is not bad at all. We were able to corroborate the truth in what they say that the road forges a band and it raises public awareness, sometimes even more that any marketing campaign. On the tour we sold more CDs that at any of the stores where we had them in stock. Q: And what do you think of this new digital tendency? J: We are all for it, as long as it does not axe physical albums. I guess I´m still a romantic in the sense that I still love buying an album, unseal it, and listen to it while I enjoy the libretto’s art, lyrics, and pictures. I love to have my shelves full with books, CDs and movies, but I understand that this is purely subjective. I believe there is room for everything. But one thing is obvious, digital is not the future any more, it is and has been the present for quite some time. Q: As an emerging band, you then see this new tendency more as an opportunity than as a threat. What market opportunities would you identify? J: I believe it is more of an opportunity, especially for those of us that can´t afford huge marketing campaigns. A threat can be piracy, but in any case, I don´t believe that in the situation we are in, an artist should feel threatened when his album is systematically downloaded on the Internet. It is public. It´s a good sign from an acceptance point of view. It is potential audience for concerts, being in people´s iPods, etc. In respect to market opportunities, I can´t really identify any yet, as we don´t have a “market”, at least not at our level. We concentrate on if people like something or not. Market as such I believe comes when you start making a profit (a big profit) with your music, and we are not at that level yet. Q: Speaking of piracy, does it really affect you at this stage of your career? J: Well, as I said before, Malpaso is not really affected by piracy, and truthfully, if we were, we would feel flattered. Nonetheless, I do have to say that I am totally against it because it´s illegal. And because even though people believe that through piracy they are messing with the industry (the middle men), they are also messing with the artists, who have increased difficulty in working and obtaining label contracts that are minimally profitable. And consequently, all this increases ticket prices and saturates the market with concerts; which is also bad for promoters and, in essence, the audience; the same audience that downloads music illegally. That is why I want to be clear on the fact that I don´t believe in piracy as an alternative to anything. It is unfair and illegal. A different debate is if labels, publishers and distributers have abused the market over decades. I reiterate, it is better to buy at reasonable prices, but buy nonetheless. Q: Where do you see the industry then in two years? J: I don´t have the slightest idea, to be truthful. I can´t picture it because everything changes way too fast. I already have difficulty envisioning Malpaso in one year, imagine the industry in 2 years! But I am going to risk it: I see it the same or worse. Q: And on top of everything, we are in the midst of a terrible recession. Have you noticed it as a band? What have you done to adapt? J: Costs have always been low. The key is for it not to translate into a reduction of our music quality, our recordings or our live performances; everything else can be sacrificed. But one thing should be clear, just because things are like they are, that does not mean we will allow being robbed. We would rather earn less, but have it be a fair retribution. Time where artists were viewed as lazy, that they lived off of air or off the shameful donations of people is long gone. And it seems that this is being embraced by the audience, clubs and promoters, but there is still a long way to go. Q: Well, thank you for your time, it was great to be able to get your take on the industry. I wish you all the luck. Check out their first album on Spotify and if you have the chance, catch one of their gigs and experience them live! Music Industry today…and tomorrow. Part 1. The view of a growing band´s manager. In what will be a series of interviews, I will try and get the views of different key players within the industry (mainly in Spain) on where the industry stands now, where it is headed, and how recession has affected their operations. Today: Part 1. The view of a growing band´s manager. The Dirt Tracks. David Giménez and Lorena Von Koschitzky are managers of the The Dirt Tracks, a growing band from Valencia, Spain that is quickly getting both national and international recognition. Inspired by the ambition of the British indie scene, Coma, Masid, Karl, Miquel, and Rafa, present themselves as The Dirt Tracks. They recorded their first single “Never Been to Mars” in June 2011, edited by David himself and mastered at the iconic studios of Abbey Road by Alex Wharton; a single that was presented as part of an UK tour and that lead to very positive reviews due to the elaborate of their work and exciting live performances. During the first semester of 2012, the band combined its Spanish shows with a tour in Germany, playing 8 gigs around the country and obtaining again a great response from fans and press. 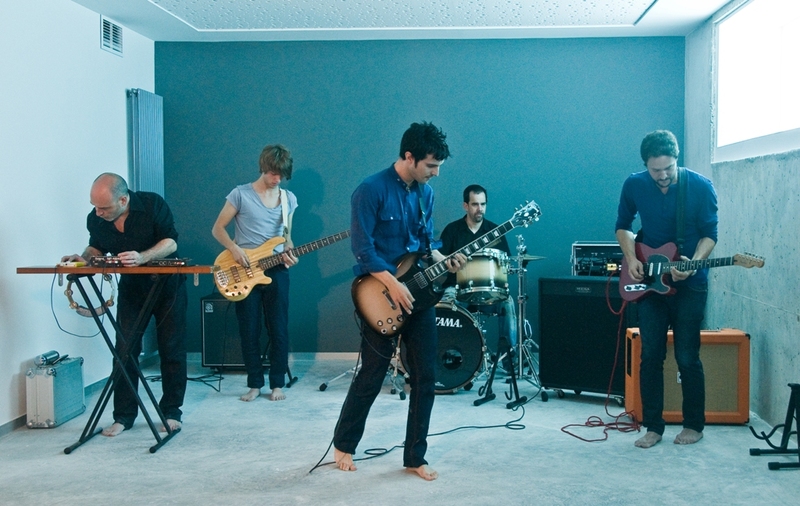 On May 15, 2012 they release their second EP The Madding Crowd and have the chance to later present this new album at the Arenal Sound Festival, sharing lineup with such established bands as Two Door Cinema Club, Kaiser Chiefs and Digitalism among others; and with a second UK tour, where it was evident that fans were already begging for a return. Their bright future now lays on the recording of their first full LP that will be presented in summer of 2013 in the UK and several international music festivals, with the possibility of disembarking on the other side of the ocean in a not so distant future. The Music Industry is becoming a digital world, where the presence of physical elements is on a continuing downfall, and where music is now available to anyone, anytime, anywhere. How has this affected your band management? What are you doing to embrace this digital era? Social Media: nowadays it is key. The closer we get to our fans, the more chances we will have to create a loyal fan base. Our first year we relied heavily on Facebook, as it works pretty well in Europe, but looking into the future, we really want to push Twitter. Obviously not forgetting about FB and trying to expand its presence to other countries. Live Shows: they are really what is going to support us as a band. We already have over 50 gigs on our shoulders in a little over a year: 4 tours (3 internationally) and 1 major festival. Our live show is very powerful and, additionally, we try to engage the public with different innovations in order to create a more interactive environment to turn the show into an experience more that just a concert per se. Blogs: they are gaining more and more importance and we are trying to work them out. They involve extra effort, because there are many that come and go, while others manage to consolidate themselves, which leads to a need of having to constantly check the web, but it´s worth it. We have had very good blog reviews and that helps us build reputation and grow. Digital Platforms: obviously we need to be in all of them – iTunes, Spotify, Deezer, Nokia, Amazon, etc. How has the decrease in record sales affected your revenue generating capacity? How are you making up for it? D&L: Live shows is our main form of revenue, that´s why we don´t stop touring. And what do you think of this new digital tendency? D&L: For us it is really an opportunity, because not being tied to a major label gives us the chance to make room for ourselves in an easier way. We have very useful tools in order to be able to reach a lot of people, something that years ago only the “big bands” had. Distribution channels are the same for them as for us, which means we are in the same “stores” as them. Having an audience is something that requires a lot of work and professionalism. What we have to do now is innovate and try to take advantage of these new opportunities that are in front of us. As an emerging band, you then see this new tendency more as an opportunity than as a threat. What market opportunities would you identify? D&L: It is an opportunity for sure. We have been able to reach places and countries that we didn´t think possible. They are listening to us in the U.S. and on the other side of the planet simultaneously, one “click” at a time, something that would have not been possible for us before. This way, we can plan possible tours in a more efficient way, as we can identify the market from the comfort of our homes. As we said before, the money is now in live performances, and with the tools we now have in the market, even though an evident oligopoly still exists, the line that existed between major label bands and us independent bands is getting thinner and thinner. Platforms like Spotify pay (not much, but they pay nonetheless) the artist directly and we believe that with time, solutions will arise so that no musical talent goes wasted. Where do you see the industry then in future years? D&L: He who would have the answer would have sure success (laughs). We hope to still be there, be bigger and have the capacity of filling larger venues (soccer fields? ); that our music is still being heard and appreciated; and being able to live of this with ease. What is certain is that whomever doesn´t know how to adapt quickly will die. And on top of everything, we are in the midst of a terrible recession. Have you noticed as a band? What have you done to adapt? D&L: It is possible that we have experienced a reduction in the attendance to shows. It is something we have noticed and that is being commented in the whole industry in general, so it is something that we already expect. However, it is something widespread, and to us it has had a moderate effect and our objective is still to grow nonetheless. We can´t stop and wait and see if things get better. If Spain starts not being a viable option, we will have to look abroad; it´s the advantage of considering ourselves an “international band”. Experience however has allowed us to also reduce costs notably, we are managing to obtain better deals with venues, and we keep making efforts to get people into them. Well, thank you both for your time, it was great to be able to get your take on the industry. I wish you all the luck.